About 42,000 species of some of the most familiar arthropods; crabs, shrimps, lobsters, crayfish, wood-lice (sow-bugs, rolly-pollies, you know, terrestrial isopods, and aquatic, even parasitic marine ones). 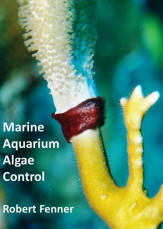 Many small members in fresh and marine habitats of importance in aquatic food chains. Primarily aquatic, mostly marine. Some common characteristics of the crustaceans: 1) Their heads are more or less uniform with five pair of appendages: they have two pair of antennae (this feature is distinctive within the phylum); the third pair as opposing, biting, grinding mandibles. Behind the mandibles there are two pair of accessory feeding appendages, the first and second maxillae. 2) Their bodies trunks are composed of distinct segments covered by a chitinous exoskeleton strengthened by deposition of calcium salts. 3) Crustacean appendages are typically biramous (two major elements). 4) They typically have a carapace covering the trunk of their bodies. Enough of this detail. We'll cover this stuff in more general survey pieces of the mega-groups. On toward the lobsters. Comprises almost three-fourths of all described species of crustaceans and most of the larger forms, such as crabs, lobsters, and shrimps. Characteristics: Trunks typically composed of 14 segments plus the telson ("tail"); the first 8 segments form the thorax, the last 6 the abdomen; all segments bear appendages. Four Superorders: Syncarida, Hoplocarida, Peracarida, and the one we want to talk about, the Eucarida. Order Decapoda includes the familiar shrimps, crayfish, lobsters and crabs. This is the largest order of crustaceans with @10,000 species. Decapods are distinguishable from euphausiaceans and other malacostracans in that their first three pair of thoracic appendages, The remaining five pairs are legs (Decapoda= "ten feet"). Decapods are further divided into two Suborders, the Dendrobranciata, with "tree-like" branched gills, body laterally compressed..., eggs planktonic, nauplius as the first larval stage (as in Artemia, our brine shrimp), Infraorders, Sections, Superfamilies... See Barnes re their higher taxonomy. 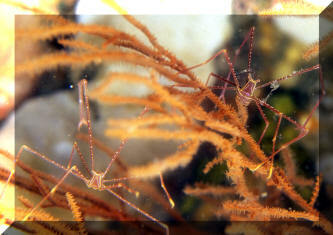 Superfamily Galatheoidea, Family Galatheidae: Squat Lobsters. Genera Cervimunida, Pleuroncodes. Crab/Lobster-like crustaceans with well-developed tail fans. First legs as chelipeds. 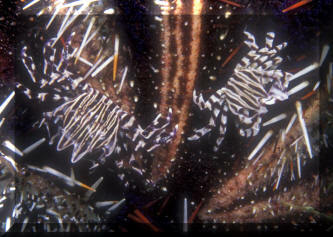 Superfamily includes the Porcelain Crabs of the genera Petrolisthes, Pachycheles, Porcelana, Polyonyx, and the freshwater Aegla. Superfamily Hippoidea, Sand or Mole Crabs. Have symmetrical abdomens that are flexed beneath the thorax. Cephalothorax flattened to cylindrical. 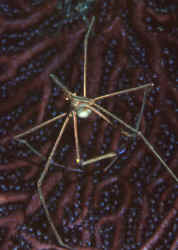 First legs chelate or subchelate (never chelipeds). Fifth pair greatly reduced. Common in sandy surf zones. Infraorder Brachyura, the true Crabs, marine, freshwater and terrestrial. Have broad carapaces which are fused with their epistomes. First legs as heavy chelipeds, third pair never chelate. Have symmetrical abdomens which are tightly held against the cephalothorax (Not able to "flap" quickly). Further divided into five Sections. Family Calappidae, the Shame-Faced or Box Crabs. Mostly hide in the sand by day. Great eaters of snails. To eight inches in diameter. Hepatus and Calappa regularly imported. Calappa calappa (Linnaeus 1758). Giant Box Crab. To 13 cm. Indo-West Pacific: Japan to Australia and Hawaii. N. Sulawesi pix. Tan to orangish in colour. Calappa hepatica (Linnaeus 1758). Bumpy carapace. Color generally white and gold but may be overgrown. Indo-Mid-Pacific; Red Sea, East Africa to Hawai'i. N. Sulawesi pix. Family Cancridae; Cancer or Dungeness Crabs. Oval bodies. Cancer antennarius, The Red Rock Crab. To seven inches across. Chelipeds with black tips, red spots on underside. Eaten by birds, humans... in turn mainly eats algae (Ulva). 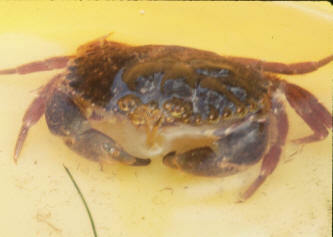 Capilius maculata Hoover, J.P. 1998, The 7-11 Crab. To 4 inches across. Aq. pic. Family Dromiidae: Sponge Crabs. Have hairy, spherical bodies. Pinchers generally with light colored tips. Carry a sponge colony or mussel shell on their backs. Hoplophrys oatesii. Soft Coral Crab. Bodies laced with pink and white lines to match their host soft corals of the genus Dendronephthya. Indonesia. N. Sulawesi pix. Pelia mutica, (Gibbes 1850) Cryptic Teardrop Crab. Typically covered in red and blue sponges. To .75". Bluish claws with dark spots. Roatan 2019. Tiaramedon spinosum Thorny Crinoid Crab. Indo-W. Pacific and Japan. To 1.5 cm. (5/8"). Zebrida adamsii White 1847. Urchin Crab. Beautiful contrasting white, brown body banding. N. Sulawesi pix. Family Grapsidae; Marsh, Rock, Spray Crabs. Have flat, quadratic shaped bodies. Many amphibious, and need to be able to get out of the water (keep tank covered). Grapsus grapsus, the Sally Lightfoot Crab. Galapagos pix. Percnon gibbesi, the Nimble Spray Crab. Tropical West Atlantic. Live in reefs, rocky areas. Hide under Urchins and rocks. 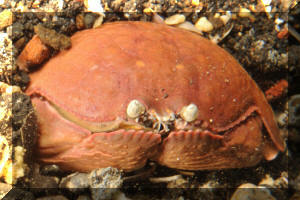 Percnon planissimum (Herbst 1804), the Flat Rock Crab. Found in shallows on roundish boulders scurrying out of view. Carapace about one inch in diameter. Nuka Hiva, Marquesas, Polynesia pix. Plagusia depressa. Both sides of the tropical Atlantic. To four inches across. This one facing up on a pier piling in Belize. Latreilla valida Haan 1839. Oval carapace, very long thin legs that are red-banded. Indo-Western Pacific; Australia, Philippines, South Africa. N. Sulawesi pix. 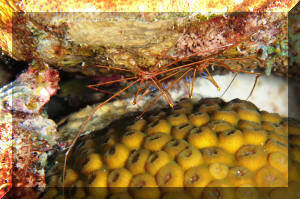 Stenorhynchus seticornis (Herbst 1788), the Caribbean Arrow Crab. Not to be trusted with small to medium fish tank-mates (may spear with rostrum, otherwise consume). Safe with hardy native corals and anemones, larger fishes. A small individual in Belize and one at wholesalers shown.